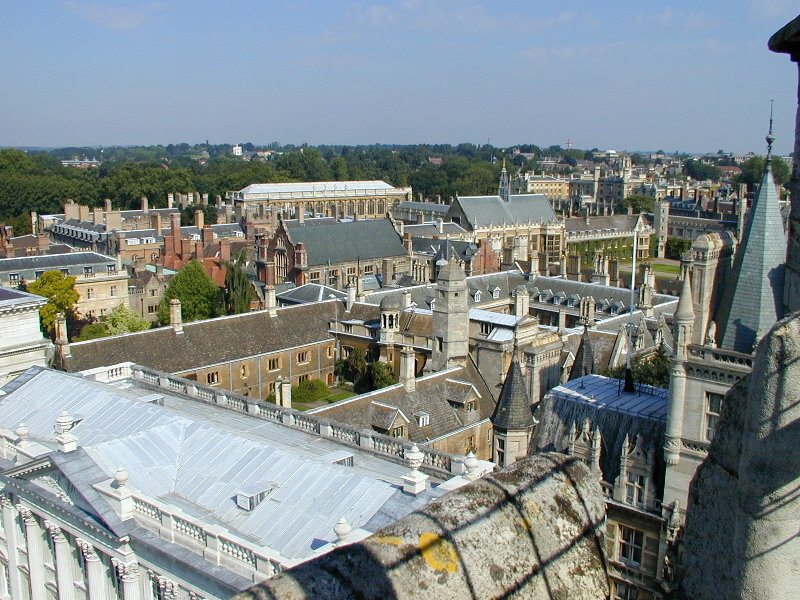 This is the view northwest towards Gonville and Caius College and Trinity College. At the right is the tower of the Gonville and Caius Tree Court. Near the middle of the photo is the Gonville and Caius Gate of Virtue. To the right of the middle is the Trinity Great Court, and in particular the Trinity Master's Lodge, and to the left of that, the Trinity dining hall, and further left of that, the Trinity Wren Library. At the bottom left is the university Senate House. The white tower on the horizon, left of the centre of the photo, is the tower of the Churchill College Møller Centre.